Posted June 4, 2015 by Joe Bourke & filed under City News, CITY NEWS. The major construction schedule for the CBD and South East Light Rail was released last week after sustained pressure on the state government for its release. Minister for Roads Duncan Gay and Minister for Transport Andrew Constance combined at an event in Martin Place last Thursday May 28, announcing that construction on the project will start in the CBD on October 23. Construction will take place along 31 construction zones over two and a half years, with testing commencing in June 2018. Independent City of Sydney councillor Angela Vithoulkas has been a long term campaigner for business rights during construction. She told City Hub that she was pleased to see the schedule, but it had come too late. “I’ve had 120 days notice for 1000 days of construction. How am I supposed to plan on such short notice?” Clr Vithoulkas said. Mr Constance said the schedule’s release was “about providing business plenty of time to prepare and plan well ahead”. “We’ve been elected to get on with the job of transforming NSW through major transport projects such as the North West Rail Link, Sydney Rapid Transit, WestConnex and NorthConnex and light rail in the Sydney CBD and Parramatta,” he said. One George Street business owner told City Hub they were optimistic about the light rail, subscribing to the idea of “short term pain for long term gain”. But Brian Liang, owner of Fresh Plus Juices on George Street told City Hub he was so concerned about the light rail’s construction that he sold his business. “From my point of view, it is a very bad idea to build a light rail in George Street, especially because they’re going to take so long to build it,” he said. 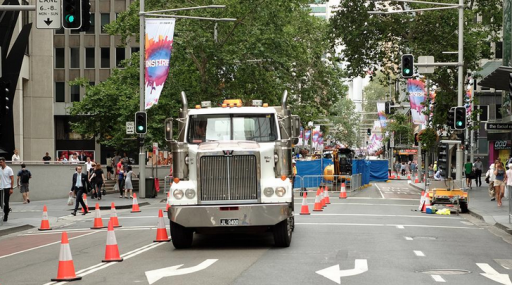 To minimise the construction pains for businesses, Transport for NSW (TfNSW) highlighted that access to business and properties would be maintained during construction, and hoardings around construction sites would include directions to businesses. A 24-hour construction hotline is also up and running for businesses to call and voice their concerns. Clr Vithoulkas said that while access to business will be maintained, she remains in the dark as to what the area will look like. “What that’s going to end up looking like, we don’t know, because maybe people will have access to those businesses but they may not want to go to the area where construction work is happening,” she said. Aside from its effect on George Street businesses, one of the biggest concerns of the construction is the relocation of the many bus services that use the CBD. A new bus timetable will be released on October 4, just 19 days before major construction starts. In a statement, TfNSW said bus stops would be moved along other corridors, including Elizabeth Street, Castlereagh Street, Park Street, Druitt Street, Clarence Street and York Street. To ease congestion throughout the period, the College Street cycleway will be removed and work will not begin on a Castlereagh Street cycleway until after construction is finished. Lord Mayor Clover Moore, who was responsible for the addition of the bike lanes, denounced the planned removal, saying it was an “irresponsible” decision to not complete the Castlereagh Street cycleway. “Safe, separated cycleways are essential for fixing congestion in the CBD and protecting people who choose to ride,” she said on her website. Roads Minister Duncan Gay said the government was doing everything they can to take pressure off the CBD. “We’re throwing everything at this to alleviate pressue – we’re appointing a central body, putting work on hold where we can and carrying out supporting road upgrades before construction starts,” he said.